Inventory We are a resale marketplace, not a box office or venue. Ticket prices may exceed face value. This site is not owned by Times Union Center Jacksonville . The Times-Union Center for the Performing Arts is a performance center and auditorium in Jacksonville, Florida, U.S. It opened in 1997, and was built on the former location of the Civic Auditorium. 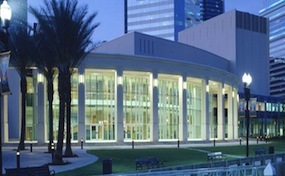 The Jim and Jan Moran Theater opened on February 8, 1997, and the The Robert E. Jacoby Symphony Hall opened with an inaugural concert by the Jacksonville Symphony Orchestra on April 26, 1997. It is named for Jacksonville's major newspaper, The Florida Times-Union, which bought the naming rights in 1994. TimesUnion.CenterJacksonville.com is a privately held company that specializes in the sale of tickets in the secondary market. We are not affiliated with any official supplier or box office. To purchase tickets to any Times Union Center for the Performing Arts Moran Theatre in Jacksonville events simply call our operators at anytime or click on the event you wish to attend.